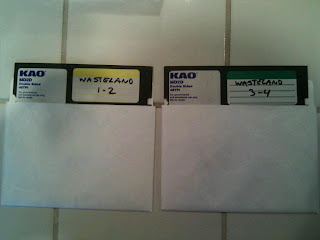 Thanks to my friend Greg at CommodoreServer.com, I have some Wasteland disk images to test out. I'm eager to get a new epic Wasteland quest started. I contemplated running this from emulation, but where's the fun in that? Here I have prepared two double sided floppies for the 4 disk images. I also found a scanned manual online. I'm really looking forward to this. I bought this game when it first came out...and I still have it! With my recent Fallout love, I have even entertained going back and trying it again.